I like to think I have a knack at being concise, at least when it comes to creating courses. Being concise, while retaining instructional integrity, is important in keeping your audience, knowledge transfer and retention. With that said, I thought about what I do to make courses concise and came up with the following strategy. I call it IMPS. Notes are added, but of course I'm keeping it short. Identify appropriate learning objectives and exclude the extraneous objectives trying to sneak into the course. Note: Identify the learners' needs through a solid needs analysis - do not rely on what the stakeholders "think" they need. Remember, ask the tough questions and observe the audience. This stage usually overlaps with the next and provides a focus throughout all the stages. Manage stakeholder, subject matter expert and design team’s expectations - get them “on-board” with designing concise, but effective courses. Note: They not only need to know the advantages, but need to be vested in the approach. Be prepared to explain and sell the benefits of a concise course (e.g., reducing cognitive overload, increase retention, time efficiency among staff, etc.). Note: These will be crucial in the following stage when you determine what to include, how to include it or perhaps if it will be delegated to additional resources. 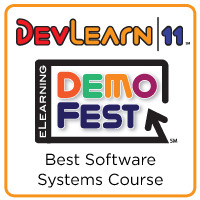 Streamline the content, language and course interface. Note: Use the prioritized levels to trim your content, present it logically and to efficiently utilize learning assets (e.g., interactions, games, visuals, analogies, infographics, etc.). Also, edit the language for succinctness and design the interface for quick and easy navigation. I will be writing more on this subject in future posts. Please feel free to add your thoughts in the comments section - Thank you. 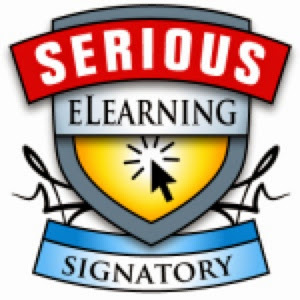 I have got on-board and signed the Serious eLearning Manifesto. I believe it is a good blueprint for ensuring quality eLearning. For successful implementation, I believe it not only requires the commitment of eLearning designers, but also the support of course stakeholders and learning & development management. I am continually negotiating with the aforementioned for the time and resources needed to develop effective learning programs. So, I think it is very important to note that we must also get them on board so we can deliver eLearning that meets the manifesto's standards. Without their support it is easy to fall into the trap of cutting corners and not meeting the level of quality our learners deserve. Thank you Manifesto Instigators for putting it all together - you did a good job. 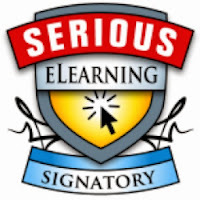 I encourage everyone involved in eLearning to read and consider endorsing the Serious eLearning Manifesto.